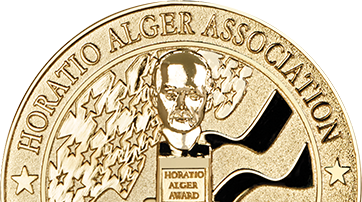 WASHINGTON, D.C. (November 8, 2018) – Horatio Alger Association of Distinguished Americans, Inc., a nonprofit educational organization honoring the achievements of outstanding individuals and encouraging youth to pursue their dreams through higher education, today announced 1020 recipients of the 2018 Horatio Alger National Career and Technical Scholarship. Currently in its third year, this scholarship program provides up to $2,500 each to students who wish to obtain career or technical degrees. The scholarships are made possible through the Horatio Alger Endowment Fund and the generosity of Walter Scott, Jr., Association Chairman Emeritus and current President of the Horatio Alger Endowment Fund. Scott is the former CEO of construction and mining industry leader Peter Kiewit Sons’ Inc. and Chairman Emeritus of Level 3 Communications, Inc.
To qualify for a National Career and Technical Scholarship, applicants must have completed high school (or earned a high school equivalency credential), demonstrate critical financial need, display perseverance in overcoming adversity and exhibit a strong commitment to pursue and complete a career or technical program. Through partnerships with organizations such as the Association of Career and Technical Education (ACTE), the Association is able to provide financial assistance to hundreds of career and technical students each year. ACTE is the nation’s largest not-for-profit association committed to the advancement of education that prepares youth and adults for successful careers. It represents the community of career and technical education professionals, and advocates for and raises awareness of this type of post-secondary education. ACTE continues to play an instrumental role in promoting the Association’s program. Since the establishment of its scholarship program in 1984, Horatio Alger Association has awarded more than $143 million in undergraduate, graduate and specialized scholarships to students from across the United States, including all 50 states, the District of Columbia, Puerto Rico and Canada. Horatio Alger Association Members – business, civic and philanthropic leaders who have demonstrated determination and a strong work ethic in their pursuit of personal and professional success – fully fund the organization’s scholarship programs. The Career and Technical Scholarship Program began in 2016 to address the rising cost of college tuition and to ensure that all students have access to a higher education. For a complete list of the 2018 Career and Technical Scholars, please click here. For more information about Horatio Alger Association, please visit www.horatioalger.org or follow the organization on Facebook, Twitter and Instagram. Founded in 1947, the Horatio Alger Association of Distinguished Americans, Inc. is dedicated to the simple but powerful belief that hard work, honesty and determination can conquer all obstacles. The Association honors the achievements of outstanding leaders who have accomplished remarkable successes in spite of adversity by bestowing upon them the Horatio Alger Award and inducting them as lifetime Members. Horatio Alger Members support promising young people with the resources and confidence needed to overcome adversity in pursuit of their dreams through higher education. Through the generosity of its Members and friends, the Association awards more than $12 million annually in undergraduate and graduate need-based scholarships across the United States and Canada and provides college support and mentoring services to its Scholars. Since 1984, the Association has awarded more than $143 million in college scholarships to more than 25,000 deserving young people. For more information, please visit www.horatioalger.org.